This is a Middle Grade fantasy set in a world that has changed since the "Blind War," though it is unclear if this is our world or another. At twelve, there is a NamingTest that each child takes to see if they will apprentice in their chosen vocation and take a new last name such as Healtouch or Treesinger, or spend a year as a Fool. When Ariel fails her Healtouch test, and is kidnapped by two Finders, the harrowing journey to discover her true vocation begins. I like to keep my eye out for interesting Middle Grade fiction, especially those that feature a strong female heroine and/or a good model of friendship. On those accounts, this is a pretty good choice. I also look for good writing, and while I did pause a bit over an awkward sentence or two, this is a pretty good choice in that aspect as well. One of my main issues with this book is with how the relationship between the main character, Ariel, and one of the strangers who kidnaps her develops. Having a seemingly bad character become not so bad after all is fine, having a kidnapper become a sort of father figure is not so fine in my opinion. However, I can appreciate how the story is constructed and the plot is moved forward with this as an integral part. As an adult reading a Middle Grade book, I enjoyed the story once I got past the almost literally tree-hugging magic that is first introduced. The magic seems to be based on a kind of animism and has references to "the Essence" and Beltane. I appreciated that the book description of Zeke being his friend Ariel's rescuer was not the focus of the story, nor is it completely accurate. 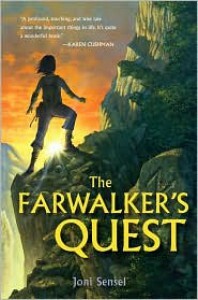 I also appreciated that the story included more nuanced characters than other Middle Grade fantasy I've read, and that the typical storyline of a right of passage test was used but did not devolve in the way many recent YA treatments of this have. For an adult reader, this is a quick, fun read with only minor issues. I am unsure, at this point, if I will continue reading the trilogy. Though I did end up enjoying the story, it is not a book I will be recommending to my middle grade niece.